Cardiac stress testing is an important diagnostic and prognostic tool in the evaluation and management of patients with known or suspected coronary heart disease. While stress testing can be performed in a variety of ways, the most commonly used and widely available stress testing modalities are exercise electrocardiography (stress test; non-imaging) and exercise combined with imaging (stress echocardiography). During a Stress Test an exercise ECG measures your hearts electrical activity, blood pressure and heart rate while you exercise by walking on a treadmill. Cardiac Stress Testing is used in the diagnosis and treatment of patients with known or suspected cardiovascular disease. Stress Echo is similar to a Stress Test, except an echocardiogram (an ultrasound study of the heart) is performed before and after exercise. During the test an exercise electrocardiogram (ECG) records your heart's response to the stress of exercise. An exercise ECG measures your heart's electrical activity, blood pressure and heart rate while you exercise by walking on a treadmill. Please do not wear body lotion or perfume on the day of your test. You should bring comfortable exercise clothing and shoes (preferably running shoes) appropriate for exercising on a treadmill and a bottle of water. Female patients will be provided with a gown. You can have a light breakfast with juice the morning of the test but no caffeine (no tea, coffee, decaffeinated products, chocolate, soda pop or medications containing caffeine). DO NOT STOP any medication on your own without checking with your physician. A cardiology technologist will perform the cardiac stress test. A Cardiologist will be present during the test to supervise and provide guidance for the technologist. The cardiology technologist will attach sticky patches called electrodes to the skin on your chest and abdomen. The technician may have to shave areas of your skin (male patients) to help the patches stick. Female patients will be provided with a gown. 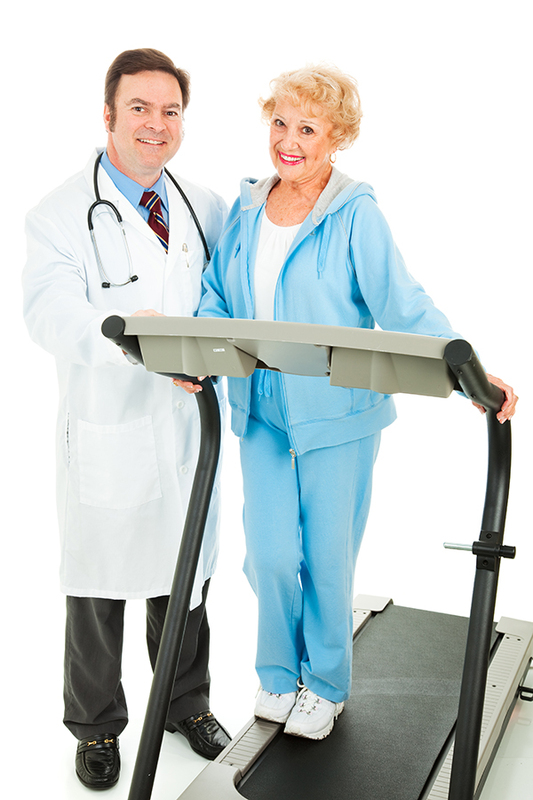 You will exercise by walking on a treadmill. You will be encouraged to exercise for as long as you can because this increases the effectiveness of the test. During a Stress Echo, test Echo images will be taken at two separate times: before and right after exercise. The ECG tracings and the echo images (during Stress Echo) will be reviewed by a cardiologist. It is generally a safe procedure, although it may trigger chest pain or irregular heart rhythms. You will be advised to immediately notify the technologist if you experience symptoms such as chest pain, shortness of breath or light-headedness. Medical staff and emergency equipment are on hand to assist in emergency situations. After the cardiac Stress Testing, the technician will remove the electrodes from your skin. You may develop redness where the electrodes were attached. This mild redness often goes away without treatment. The test lasts anywhere from 30-45 minutes. However, you should allow about one hour for the entire test. You can usually go back to your normal daily routine after the test. The ECG tracings and the echo images (in case of Stress Echo) will be reviewed by a cardiologist and the results will be sent to your referring physician.